Whilst J was busy rearing mealworms, Little E asked me if she could also keep a pet. It just so happened that one of my old schoolmates is a primary school science teacher (henceforth referred to in this post as Mrs Great), and she had access to some caterpillars. She offered to give Little E a few of them and I was so excited to have another opportunity to study some more little creatures up close! The very next day, Mrs Great rocked up with a clear tupperware that had four spiky black caterpillars, each about a centimetre long, happily nibbling away on spray of lime leaves. I don’t have a lime plant at home, so I was a little bit worried about having enough leaves for all the caterpillars – but Mrs Great assured me that there were probably enough leaves to last the caterpillars about two weeks. The next day, about half the leaves were gone, and the little black caterpillars had doubled in size, developing streaks of bright green. There were also little dry balls of caterpillar poo rolling about the bottom of the tupperware, which I emptied out into a flower pot on my balcony. This wasn’t a particularly nasty job as everything smelled pleasantly of lime juice. On the third day, one of the caterpillars had turned a bright green and was the size of my little finger. It was eating up the lime leaves at an alarming rate. I sent a text message to my friend Mrs Great, who was kind enough to drop by with a bunch of lime leaves, but I knew that at the rate the caterpillars were going, I would definitely need to find more lime leaves before the end of the week. Sure enough, by the start of the fifth day, it was clear that I would need to find more lime leaves for the caterpillars or they would certainly starve. Unfortunately, I went to three different supermarkets and three different wet markets and nobody had any lime leaves for sale! By this time, Little E was nearly in tears, upset that her caterpillars might starve to death. However, as I was driving home, I passed by my local community garden. I stopped by, hoping against hope that I would find the leaves that I needed. I didn’t think I’d be able to identify a lime plant without it’s signature green fruit, so I ran around taking pictures of various little plants and sending them to Mrs Great for identification. Fortunately, one of the pot plants had a tiny little green lime hanging on the one of the stems! Hooray! Community gardens save the day! I plucked off a spray of leaves and triumphantly brought it to Little E who was waiting in the car for me. The Aged P also went to talk to the security guard of her flat who keeps a variety of plants in his little guard outpost – and he so happened to have a lime kaffir plant that he was carefully cultivating. She managed to convince him to part with a few leaves which I kept in a cup of water to keep them fresh. I was almost down to the last spray of lime kaffir leaves when we noticed that the caterpillars had stopped eating and were curling up on themselves, wiggling very slowly. One by one, they each moulted one last time, forming chrysalids that were securely fastened to the sides of the tupperware by silken threads. About a week later, the first butterfly emerged from it’s chrysalis! Little E was so excited, watching it pump it’s wings to fully inflate them and dry them out. We released it on our balcony and it rested there for a few hours before fluttering off. As for the other three chrysalids, we noticed that all three had turned translucent one morning – we could see the black and white butterfly wings folded up beneath the surface of each chrysalis – so I told Little E to bring the tupperware to her kindergarten and share the magic of the butterfly with her classmates. J came home one day and asked for a disposable tupperware for school. His Science teacher wanted each child to bring home a mealworm to rear over the March school holidays. I didn’t know anything about mealworms so whilst he was in school, I did a little bit of research and found out that they are quite easy to rear – all they need for food and bedding is dry oatmeal. They get enough water from their food, so it isn’t necessary to provide a water bowl, which acts more like a death trap for unsuspecting mealworms. Of course, when J brought the mealworms home, both the mealworms were lying in a small puddle of water. It had been a hot day and J thought they might need a drink – all living things need water to survive, right? Neither of the mealworms appeared to be moving, so I told J that he might have accidentally drowned both of them. Poor J was crestfallen. Just then, A Becky C happened to phone up for a chat. Well, I remembered all of a sudden that she used to rear mealworms in an old pencil case! Ah ha! Help has arrived! “DEBS!!!! I have something important to tell you!” she chirped in my ear. So J dried the mealworms off with a tissue and sure enough, after a few minutes, one of the mealworms started to twitch it’s legs ever so slightly. Then it seemed to wake up and start crawling around again. The other mealworm just lay quietly but every so often it would twitch and shudder, as if remembering it’s watery ordeal. I transferred the mealworms into a dry container with a nice layer of dried oatmeal, and both the mealworms immediately buried themselves in the meal. By the next day, one of the mealworms was fully revived and was running laps around the perimeter of the container. The other worm was very lethargic. It moved so little that we were convinced that it was dead. Turns out, the blessed creature was busy pupating – it eventually shed its skin and turned into greyish-white pupa. A week or so later, the pupa split open and a white beetle crawled out, which turned brown, then black. J and Little E took turns feeding the mealworm and darkling beetle. Occasionally, if they were eating a piece of fruit, they’d drop a small piece in as a treat to the beetles. Of course, Thumper was most fascinated by the little creatures and would check on them many times an hour. I had to teach him to stop picking up the container and shaking it around, which would send both the mealworm and darkling beetle into spasms. Eventually, he learned to grip the edge of the table instead and just bring his head down to the table surface to peek at the insects. I’m so glad that he’s learned how to respect small creatures! Rabbits have long since been considered a pest in Australia. I mean, the longest unbroken fence in the world was built in the country to keep the rabbits out of precious farming territory. Besides, there’s well documented evidence that the introduction of rabbits can vastly alter the ecosystem. Heck, the adorable little rabbit is believed to be responsible for the decline of several Australian native species such as the Greater Bilby through habitat destruction. It is no surprise that the Australian government works to control the feral rabbit population through regular releases of biological agents like the Calicivirus (aka Rabbit Haemorrhagic Diseases). In fact, a planned release of the virus is happening across 1,000 sites across Australia as we speak! For those of you not in the know, the Calicivirus is a very nasty killer. It basically makes your rabbit bleed out internally, until it finally dies from the stress. BUT! A vaccination for this horrible disease does exist and is available at most local vet clinics! Both Bonnie and Clyde are regularly vaccinated against Calicivirus, so they’re covered in the event of a planned release. Bonnie and Clyde after being vaccinated. They’re very upset about the whole situation, but it’s for their own good! That being said, it doesn’t hurt to take extra precautions to protect the rabbits from the dangers of horrible diseases. Both Calicivirus and Myxamatosis are spread by flies and mosquitoes, so you should take steps to insect-proof any rabbit play areas. To protect our precious bunnies, The Boobook and I lined Bonnie and Clyde’s outdoor hutch with UV protected mosquito netting. It’s a little bit expensive, but at least it’ll keep them safe. Plus, we’ve lined the bottom with thick gauge chicken wire so that they can’t dig their way to freedom and get themselves hurt. So, now our babbits are free to dance and play in the sun and are safe from the virus come rain or shine! If you’d like more information on how to protect your rabbits during this viral release, RSPCA Australia has some very useful information and advice available. Calicivirus is pronounced Khaleesi-virus, but doesn’t have anything to do with dragons, unless you count the fact that it kills kinda messily. Okay okay okay, A Becky Lee, your version of the Skycat Phenomenon seems a wee bit different from what I actually remember! A Becky Lee has a history of live animal smuggling. A Becky Lee, animal smuggling since 1995. This happened what I was in London and A Becky Lee was a student in Sydney. At the time of the Skycat Phenomenon, A Becky Lee had been feeling lonely and isolated in Sydney (it was winter at the time and Sydney winters are dark and rainy and wretched) and her proposed solution to this issue was that she needed a Kitten. The Aged Ps said that she could not buy a kitten because kittens require time, attention and financial resources for proper care, which A Becky Lee would only be able to provide at the expense of her studies and personal nutrition. A Becky Lee responded to this parental logic by crying and generally being utterly miserable about it. So, when A Becky Lee rang me up at dinnertime in Sydney, I was already midway through a morning ward round and had ducked into an empty side room to take the phone call. I answer my phone and off goes an excited jabbering in my ear with A Becky Lee yelling DEBS DEBS THERE IS A CAT I HAVE A CAT IN MY HOUSE. I am even more appalled. What does she mean “it came from heaven”? A Becky Lee shrieks. Loudly. “….leave it alone.” I finish my sentence and rub my forehead, sighing to myself. She must have tried to drag it out from its hiding place and the blessed creature probably scratched her. I start to explain that maybe she can call animal services to ask their advice because the cat is probably microchipped, when she hangs up on me. Typical. About, twenty minutes later, I get another call from A Becky Lee. She is much more calm this time and the cat has been returned to its rightful owner, but she’s still feeling on edge from all the excitement. After we discuss where she can get some antiseptic cream for the cat scratches, I burst out laughing at her. “Why you laugh at meeeeeeeee?” whines A Becky Lee. 1) Listen to your older sister before doing anything stupid. 2) If you want sympathy after doing something stupid, you won’t get it from your older sister. She will laugh in your face. Since the new house that The Boobook and I moved into is much larger than my little apartment and has a spacious garden, we decided to add a little to our family by getting a pair of rabbits! It’s best to get rabbits in a pair so that they can keep each other company. As prey animals, rabbits tend towards having a little bit of a protective warren mentality. A single rabbit on its own might get a little lonely. Our new rabbits, Bonnie and Clyde! It just so happened that a friend of mine happened to have some spare baby rabbits. See, she’d gotten a pair of rabbits from a neighbour who swore up and down that they were desexed. Well, they weren’t. So within a week of her getting the little animals, they did what rabbits did and she was inundated with lots of little mini-lop rabbits. Bonnie and Clyde (or Bonbon and Clydie, as we call them) were the last pair left of the first litter and she’d kept them aside for me just so that I could have them. They’re sweet rabbits, both female and extremely well bonded! Chillin’ after a good grooming. Clyde, the brown rabbit, is more temperamental. She’s got an opinion and she’s not afraid to show it! She’ll tolerate patting, but absolutely hates to be picked up. She’s much more adventurous than Bonnie is, and absolutely loves her food! She’s often face-first in the hay loft as soon as it’s filled. Either way, I’m happy to have them. They’re a happy addition to our family. If they’re well cared for, rabbits can live up to 12 years, so J, Little E and Thumper will have plenty of chances to meet them when you come up to visit! Now, all this writing has tuckered me out. I think I’ll have a nap. Sorry about Clio. It sounds like she was a lovely pet rat and it must have been a tough decision to have her euthanised. I’ll have to tell J and Little E about her – they’ll remember her from when their last visit to Australia. When we first started this blog, you asked me once about introducing pets to kids. The Barn Owl and I have always thought it important for the kids to be kind to animals so we have always encouraged J and Little E to interact with animals (under supervision, of course) and they have even had the opportunity to keep siamese fighting fish last year. Well, one of the very important things to remember about keeping pets, is that at some point kids (and parents, too) will have to deal with the eventual loss of their beloved pet. Two years ago, the Outlaws also had to make the decision to euthanise their cat. Poppy, as she was known, was a wild cat that the Mother Outlaw tamed over the course of several months. Poppy had always been a rather anxious sort of cat, but as she got older she became increasingly more neurotic, often biting her own tail. The tip of the tail became infected, dripping blood and pus everywhere and would only heal after a course of antibiotics and sedatives. The sedatives made Poppy clumsy and she would fall over whilst walking around the house. Without the sedatives, Poppy would start attacking her tail again, reinfecting it. Eventually, the vet told the Outlaws that Poppy was mentally stressed and that there was no other way to help her other than to amputate her tail and then keep her on sedatives for the rest of her life in order to prevent her from attacking the stump. The Outlaws then made the decision to have Poppy euthanised. J and Little E had quite a good relationship with Poppy, who was surprisingly tolerant of them despite her skittish nature, allowing them to approach her and stroke her. Whenever we spoke with the Outlaws over Skype, the children would eagerly ask after Poppy who was quite often sitting near the computer on the bed or on the windowsill. Needless to say, when we got the news from the Outlaws, we knew that we had to let J and Little E know that Poppy had died. Both the Barn Owl and I have had formal training in how to break bad news during our medical undergraduate days, so we employed some of these techniques with J and Little E – with some changes of course. First, we prep the kids for the bad news by helping them to anticipate what is to come. We put on our most sombre expression and follow it up with a statement like, “Hey, Mummy and Daddy have something serious to tell you so can you come and sit with us in the study once you are done putting away your toys?”. This gives them a little bit of time to steel themselves emotionally. Next, we choose a quiet, distraction-free place to talk to them. This means that we do not begin our discussion whilst in the car, in the playground or in front of the television. We turn our phones off so that there are no interruptions. We also make sure that the kids are in a safe and secure environment where they will feel comfortable expressing their thoughts and feelings. Usually this means that they are sitting in our lap or cradled in our arms. When breaking bad news, go straight to the point and avoid using any euphemisms. It’s actually surprisingly difficult to say something as simple as “Poppy is dead.” People sometimes prefer to use terms like, “passed on” or “gone to a better place”. For children, those phrases can be confusing and obtuse, leading to awkward questions such as “Where did they pass on to?” and “Why aren’t we at this ‘better place’ as well?”. Another thing that we do is that we tell the children the truth, in as much detail as they want to know. This seems a obvious thing to do but it is difficult to resist the urge to make the truth more palatable in order to avoid difficult questions, especially with regards to euthanising pets. Answer your child’s questions as directly as possible, keeping your answers clear and simple and avoiding the use of jargon. Debs G: J, you remember Poppy the cat? Debs G: Well, Poppy died. Debs G: If you want to ask me anything about what happened, go ahead. J: I have a question. Debs G: Ok. What do you want to know? J: Can I go and play with my blocks now? This reaction may be surprising to adults, but it is no means an indication that the child is indifferent to the news nor that the conversation is over. If your child reacts in this manner, don’t press them for their thoughts and feelings or continue to repeat yourself in the hopes of eliciting a response (‘DEAD! I said it’s DEAD! Did you hear me?’). It may be necessary to give kids some space, maybe even some time alone while they think about the news. J actually came back to me about an hour later, wanting to talk more about Poppy, and this time he was very sad and tearful, wanting a hug and more information. When I was on holiday, I received a message from the pet care facility where I’d boarded my rats. 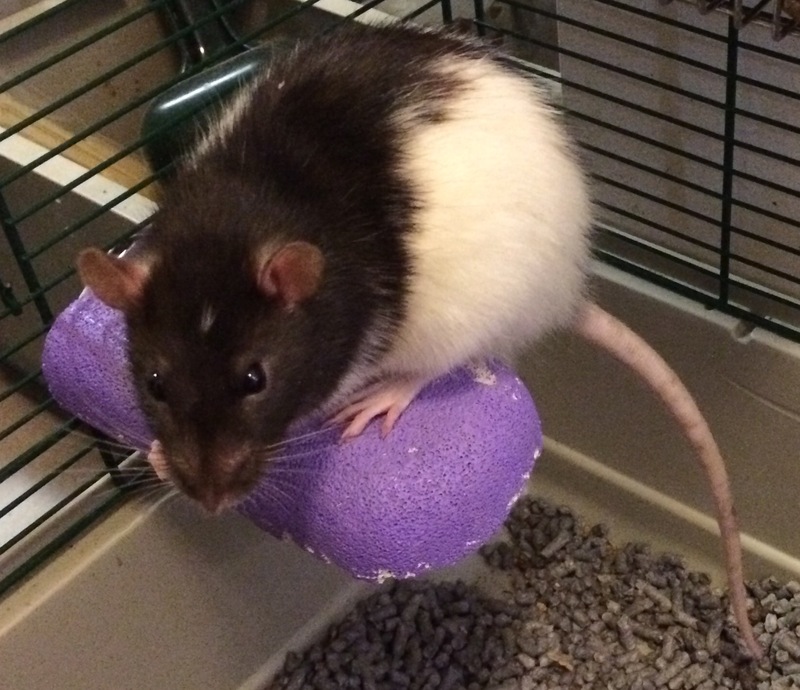 Clio, my black berkshire rat with the sweet personality, was losing condition and wasn’t responding to antibiotics. The owner of the facility was very apologetic and warned me that Clio did not look anything like she did when she first went to boarding. Clio greeted me happily upon my return, but she was a lot worse for wear. The facility owner and I discussed her symptoms and agreed that it was highly likely that she didn’t have a viral condition, but a neurological one – possibly a stroke. She’d developed a head tilt and could no longer walk straight. Still, as Clio nuzzled my fingers, I thought that since she was still eating and making happy rat sounds (bruxing), that perhaps we could get her back to her old condition through good feeding and careful care. Over the next few days, Clio would greet me happily whenever I went to the cage. She still ate and drank, though her fur remained raggedy and her eyes were often crusted with porphyrin. Every morning, I would clean her eyes and feed her by hand. When I did so, she always rewarded me by bruxing and nuzzling my fingers. …But her condition didn’t change. In fact, she worsened. She spent more and more time asleep. When she was awake, she would toddle in circles and fall over. Sometimes, she would attempt to climb the cage walls to greet me, but would always fall over after the third or fourth rung. After a while, she would stretch out her legs involuntarily whenever she was picked up because of her balance issues and possibly because she was having difficulty breathing. But… she always nuzzled my fingers and bruxed, as if to show willing. On Thursday, two weeks after I took her home, I realised that Clio wasn’t going to improve. She was getting worse every day, slowing down and sleeping more. Some mornings, the porphyrin crusting was so bad that she couldn’t open her eyes. It was clear that she was dying… and that she was in a lot of pain. Bring Clio home and manage her pain until she died naturally. Have her put down immediately. Making the decision to put an animal to sleep is very difficult. Generally, there’s a gut feeling when it’s time to say goodbye to an animal. Most of the time, your pet’s behaviour will clue you into how they’re feeling, especially if you’re close to them. Clio stopped playing with her cagemate and spent most of her days asleep. Towards the end, she was really slowing down and though she would rouse herself and eat, it took her a long time to wake up. Though Clio never lost interest in her food or water (something I always take as a sign that an animal is dying, as once they stop eating, the end is almost certainly near), it was becoming increasingly difficult for her to get the food she wanted. If you’re already asking yourself whether or not you should be putting your pet to sleep, in a way, you sort of know if you should. However, you should always speak to your vet about your pet’s condition before making any serious decisions. Sometimes, a pet in a great deal of pain can be treated with hard work. If your vet is only offering pain management options and has let you know that the disease is terminal, then it’s up to you. Euthanasia isn’t for everyone, which is why our vet gave us the option of managing her pain until she died naturally. Either way, losing a pet is hard, so always give it lots of thought before you decide for or against putting your pet to sleep. Since I couldn’t bear to see Clio suffer anymore, I made the decision to have her put to sleep. The vet took her away, then brought her back in a little box. We buried the box in our backyard and planted a blueberry bush over it as a memorial. Clio had expensive taste and she always loved blueberries. A reddish oil produced by rats naturally to soften their fur. A sick rat often overproduces this oil and can’t groom it through the fur properly, leading to it crusting around the eyes and nose.